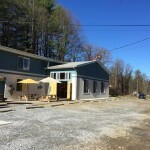 Welcome to South Asheville’s first and only brewery! Brews On Tap brewed by Sweeten Creek Brewing include: Porter, Brown Ale, Black IPA and Pilsner. Naked Apple Hard Cider and wines are available. We also feature rotating Guest Taps from other great WNC brewers. Open Monday-Saturday 11:30am-9:00pm – 1127 Sweeten Creek Rd. in Asheville. Note: We are located directly behind George’s Store Mor building on Sweeten Creek Rd.- Watch for signs to direct your turn into our driveway.